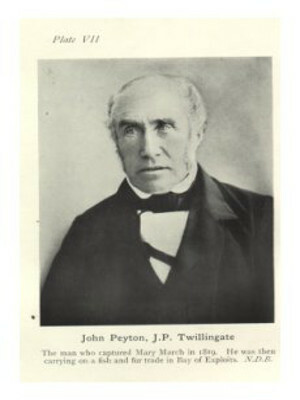 In 1812, John Peyton Jr. moved from his home in England and settled in Twillingate. He made his living through fur trapping and some cod fishing. In the summer of 1815 he discovered that one of his fishing boats had been cut adrift and its sail and fishing tackle had been stolen, presumably by Beothuk Indians who lived in the area. Two years later several of his traps used to catch marten were also stolen. The following year John Peyton was dismayed again to find that a boat he had loaded with salmon was also cut loose and its cargo stolen. At this point he decided to put a end to this thievery and organize a small party of men to help him get his property back. He also hoped to gain the cooperation of the Indians in order to prevent any further damage to his property. 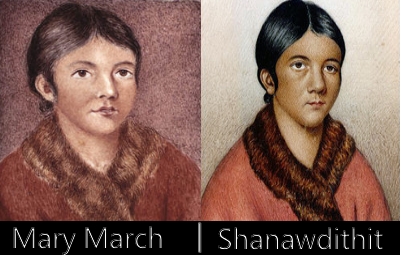 After several days travel up the Exploits River they captured an Indian woman called Demasduwit , who the locals named Mary March because she was captured in the month of March. .
John Peyton took the captive woman to St. John's, with the intention of eventually returning her to her people laden with gifts as a token of friendship. Unfortunately, Mary March died of tuberculosis on June 6, 1829. She was believed to have been the Last of the Beothuks. Of all the Newfoundland settlers, it was John Payton Sr. and his son John Payton Jr. who had the worst history with the Beothuk. John Payton Sr. had clubbed several Beothuk to death. In 1819, his son, John Payton Jr., was under orders to capture a Beothuk woman to use as an interpreter. He surprised Nonobawsut's wife, a Beothuk woman named Demasduwit, carrying her baby. She tried to get away but was too ill to run. Nonobawsut tried to save her but was shot dead by Payton. Demasduwit was captured and renamed Mary March (because she was captured in March). She was taken away and then promised that she would be let go but died of tuberculosis before she could get back to her village.John Peyton took the captive woman to St. John's, with the intention of eventually returning her to her people laden with gifts as a token of friendship. Unfortunately, Mary March died of tuberculosis on June 6, 1829. She was believed to have been the Last of the Beothuks. Miss Georgie (Georgina Ann Stirling) was born in Twillingate, April 3, 1866, the youngest of 10 children born to Ann (Peyton) and Dr. William Stirling. 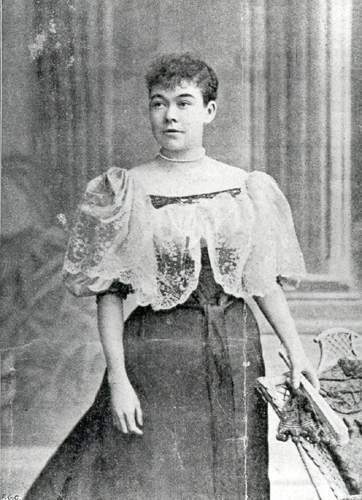 Georgie was Newfoundland's first Opera singer and became known as the Nightingale of the North. Georgie was educated in Twillingate, Toronto and went on to study voice in Paris, Italy and Germany. While living in Paris she studied under the tutorship of Madame Mathilde Marchesi. It was there that Georgie was discovered by a Milan opera company. She became a world renowned Prima donna soprano who played in opera houses throughout Europe and United States known by her stage name Mademoiselle Marie "Toulinquet" which was the original French name of Twillingate. Georgie toured and accepted engagements with many operas such as the Opera Company of New York City, the Boston Harmony Orchestral Society and the Scalchi Opera Company. Unfortunately, at the peak of her career she developed a throat ailment that cut her singing career short. Georgie returned to her hometown of Twillingate to live with her sister Rose where she eventually died in 1935.. The people of Twillingate are very proud of their Nightingale of the North, Georgie holds a special place in all our hearts. There is a permanent Georgina Stirling Exhibit at the Twillingate Museum featuring her life and achievements. The Anchor Inn Hotel in Twillingate's restaurant, Georgie's, has been named after Georgina and displays a 2012 painting by Twillingate artist, Nina Keogh.